Halloween comes only once a year and it’s that time of year we get the Walking Dead back on TV, the Simpsons Halloween special and a reason to dress up outside convention season. Aspen comics always try to do something new with every comic release and this October 25th they are releasing a special edition anthology. The activity / coloring book collects Fathom: The Adventures of Ernie and Soulfire What the Dragon? Written by Vince Hernandez with art by Agnes Garbowska (with puzzle and activity assists by Juanchoo and Andrea Shea. The 32 page comic is aimed at the kids but I have a feeling a lot of adults will enjoy coloring this story too. 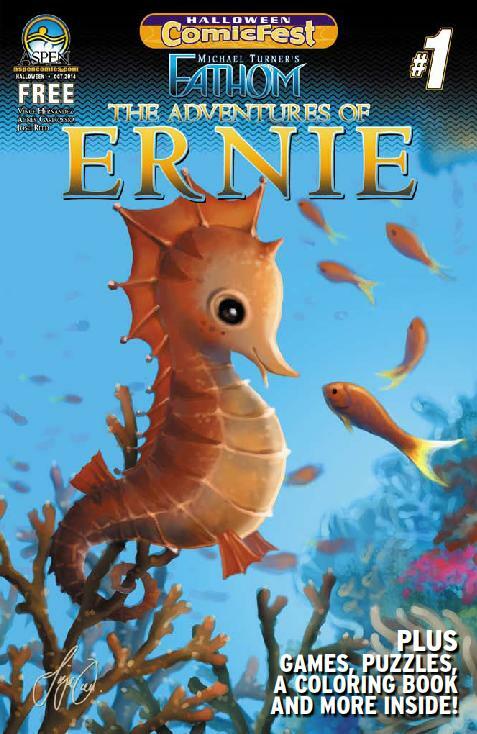 The first epic story follows a lost seahorse who needs your help to find the sea through completing puzzles and coloring in pages. It’s unlike anything I have seen released by Aspen before but they really know their comics and like to have fun with publishing their own stuff. Hopfully my local comic shop will be stocking this in bulk as it’s one I could easily buy ten copies of this one even if its just to draw all over nine of them and to keep one to get signed.